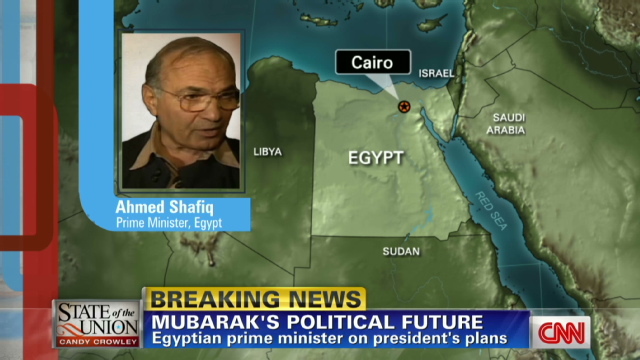 In a live interview on CNN’s State of the Union, Egyptian Prime Minister Ahmed Shafiq told anchor Candy Crowley that President Mubarak will remain in office until September. He also asserted that the detention of journalists and human rights activists is “not allowed” and is “not intended.” Links to embeddable video and the CNN Political Ticker are below. The full transcript of the interview is after the jump. CANDY CROWLEY, HOST, “STATE OF THE UNION”: I’m Candy Crowley in Washington. We do indeed have the chance to interview Ahmed Shafiq. He is the Prime Minister of Egypt, and we have him on the phone now. Mr. Prime Minister, can you hear me? AHMED SHAFIQ, EGYPTIAN PRIME MINISTER: Now I hear you good. CROWLEY: OK. Thank you so much. CROWLEY: Let me ask you first — there are reports that the state of emergency, which I believe has been in place in Egypt since 1981, has been lifted. Can you confirm that or deny it? SHAFIQ: May I ask you kindly to repeat your message in a more louder voice, please? CROWLEY: Yes. I was asking, has the state of emergency in Egypt been lifted? SHAFIQ: If you are speaking now concerning the emergency now in Egypt, the emergency situation, I don’t say that the problem be over now. But the situation today is extremely better than yesterday, and the discussion between the old factions are going on. We spoke together today with all the ideas, (INAUDIBLE) in the fields. Hopefully tomorrow or after tomorrow we will get better raises now, because I think the ideas are nearer each other now than before. CROWLEY: Mr. Prime Minister, our reporters on the scene in Cairo tell us that while you negotiate about a democratic process, there are still arrests of local and international human rights activists, as well as journalists. Why are you arresting them? SHAFIQ: I didn’t understand you. I didn’t understand you. CROWLEY: We are told that you are arresting human rights activists and journalists. Why? SHAFIQ: No. I don’t hear well. I don’t hear well now. CROWLEY: Can you tell us about President Mubarak? Do you expect him any time soon to resign? SHAFIQ: If you are speaking about the situation with President Mubarak now, you know that President Mubarak will leave in September. And now the discussion is if he’s able to leave before or not. We insist here in Egypt to continue his period until the end of September, the month of September, because during this period we will be headed by the president, and a lot of points must be covered before he leaves. So I think we are in bad need for the presence of (INAUDIBLE) because that will be easier for us to fulfill the mission we are looking to get. CROWLEY: Will the demonstrators accept President Mubarak staying until September? SHAFIQ: Because he’s — the former period must be ended in September, and we have another six months to work with him, changing all the points, or working on changing all the points that we discussed with the majority of the ideas existing in the market here. And we think that this formal action must be respected, and no need to change this time as far as we are already changing all the needed points to be changed. CROWLEY: Mr. Mubarak will not leave until September. Is that correct? SHAFIQ: Yes, exactly, in September. CROWLEY: About the detention of human rights activists. Why are you detaining them? SHAFIQ: Oh, frankly speaking, there is some problem. It’s not intended at all, my dear. Frankly speaking, I insist to assure all the authorities here not to ban anyone or not to bother anyone doing his work (INAUDIBLE). But during some periods as such the period we are passing now, we will not be — it’s rather difficult to be sure 100 percent that this man or either man gets some bad behavior concerning the foreigners here, and he doesn’t understand well their work or their job or something like that. So we have to excuse him for such action done with this group because this is not at all intended, my dear. And we insist to cover this point. And I repeat again, hopefully that will not be — this phenomenon will not be existing after that. CROWLEY: We were told by our reporters today that you have arrested another Al Jazeera reporter from Al Jazeera English, as well as more human rights activists. And it’s the Egyptian military police. Do you have a way to get them to stop those arrests? SHAFIQ: After our telephone now, after our call now, I will go directly to check this point. And if you permit me, I will give you an answer if there is something like that. But they are not allowed at all to do something like that. CROWLEY: We would appreciate a return call. That would be great. And finally, let me try one more time. CROWLEY: There are reports that the state of emergency that was imposed in Egypt in 1981 has been lifted. Is that true? SHAFIQ: Frankly, I didn’t understand your meaning now. Can you repeat it for me? What about 1981? CROWLEY: A state of emergency declaration. CROWLEY: Has that been lifted? SHAFIQ: Do you want to say that keeping the case of emergency during the oldest period since 1981 until now, or something like that? CROWLEY: Has the state of emergency been lifted? SHAFIQ: I think if I understand perfectly your paragraph now, I think even this point is discussed now. And I don’t know. I can’t give you my answer perfectly now because I can’t get the meaning exactly that you mean. Thank you so much for taking the time. We look forward to talking to you again when you’ve checked into these things. We totally appreciate your time. SHAFIQ: Please be sure that concerning our friends working here with us, I will assure now that nothing is banning the work, and excusing for any action like that against them. CROWLEY: Thank you so much. We look forward to that. I appreciate your time. Thank you. SHAFIQ: OK. Thank you, my dear. Bye-bye.